Krista McLaughlin - YA Author: NaNoWriMo Winner 2014! Whew! I'm done. Parts of it turned out completely different than I thought they would, but that's what happens since I'm a pantser and really went into this novel with a title and a general idea of a cheerleader and a male dancer. Here's what I ended up with! Thursday of Homecoming meant our pep-rally in the gym. Eve insisted on coming back to school, but I negotiated if she didn't play her flute to give her sick lungs a chance to heal some before Friday's game. I adjusted my uniform skirt as I stood up and headed toward the gym. We'd been dismissed a little earlier than the rest of the school to give us a few minutes to set up and warm up. Thackery stretched behind me, gently smacking the back of my knee with his foot. I put my hands on my hips. “I would look adorable in that skirt.” Thackery laughed, causing my heart to contract at the sound. “Hey Ellie, how are you, baby?” Mark jogged over to me and wrapped an arm around my shoulder. Thackery rolled his eyes and went to talk to Eve as she sat on the sidelines next to the band. For some reason, it hurt to see him walk away and I didn’t want to think about him laughing with my sister. Mark flipped his head to the side and I forced myself to keep smiling. Good luck to everyone still writing their novel and if you've already finished, congratulations! :) I'm off to celebrate by having an early Thanksgiving with my sister and brother-in-law. Have a great weekend! Wow! 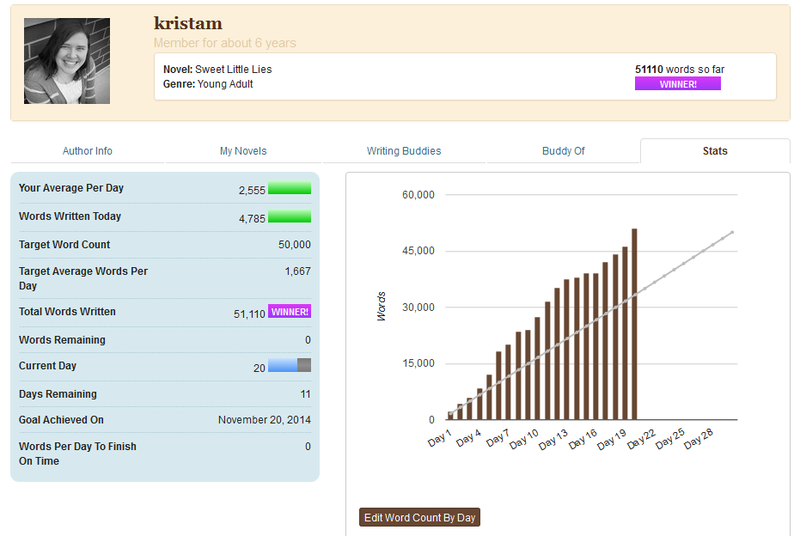 Huge congratulations on finishing NaNoWriMo -- and so early, too! Wow! I'm in awe of you! And I love your premise and the snippet you shared. SWEET LITTLE LIES sounds wonderful! Good luck with it!